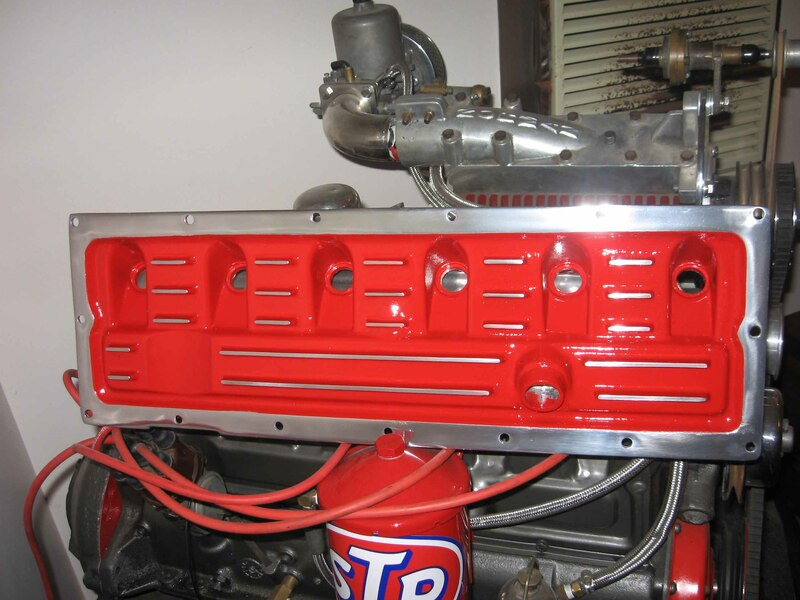 The distinctive rattle of an early Holden side plate engine is a noise that brings back the thought of yesteryear. 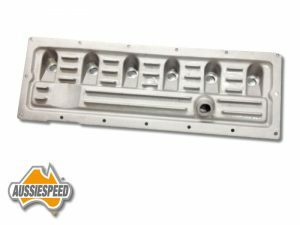 Aussiespeed is one of the very few manufacturers left that still offer a line up of early bolt on period style speed equipment for the Holden Grey motor and where possible stock replacement parts for your rebuild. Pistons, rings, bearings, conrod bushes, oil pumps and gaskets are just some of the products we are continually trying to source either new or NOS to have a continued supply of parts. 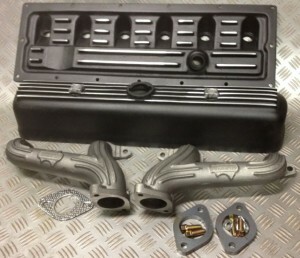 Pictured is a grey motor header, alloy rocker cover and side plate that was ordered in wrinkle black for a customers FJ Holden ute. The Aussiespeed range of dress up gear can be painted, powder coated, polished or left the natural shot blasted as cast aluminum finish. Old Holden grey motor aluminum side plate. 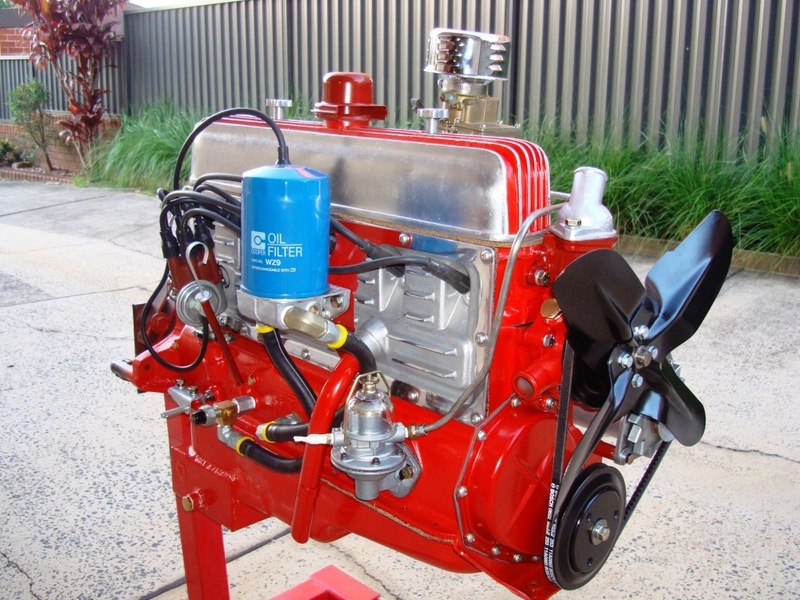 fully rebuilt & detailed Holden grey motor being fitted to an ej Holden. the walking stick breather on the Holden grey motor can be fitted to the Aussiespeed sideplate, the boss is drilled & a baffle plate is laser cut & mig welded on 4 raised cast pins to eliminate oil running straight the hole. we believe oil leaks should not be to much of a problem if the cover is fitted correctly. When fitting it is important that you check clearance of the pushrods to the spark plug housing sides. that the plug seals are cleaned with a solvent. The cork plug seals need to be stuck to the cylinder head with a sealant & be sure they are correctly aligned. the outer rim of the sideplate is just under 5mm thick. the reason for this is at 5mm the cover can flex as bolts are tightened or tapped with a soft face hammer to be shaped for a perfect fit. 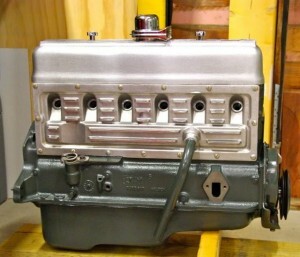 The irregular shape of components & bolt holes on the grey motor can differ by a few millimetres from engine to engine. 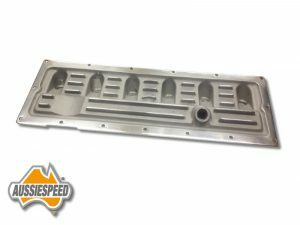 With a bit of patience there should be no problems getting your Aussiespeed sideplate to seal unlike some of the old relics that were cast in uncertified grades of aluminum & to heavier wall sections. the long awaited early Holden alloy sideplate is finally close to being finished. After doing the test fitting & with a few small changes to do, this would have to be the most difficult project we have ever done. With Aluminum when it is cast there is a thing called contraction or shrinkage, It normally works on a rate of 1mm contraction for every 70mm of length,width,height & so on. So your thinking how hard can this be, What alot of people do not know is the figure is 1 in 70 contraction in theory but with curves, fins, metal thickness, metal temperature where the in gates or the metal is feed from are all factors that can be very frustrating. It is not only the over all size that shrinks but the spark plug hole centres have to be spot on 2mm either way & the bloody thing wont fit, bolt flanges, push rod clearance on the spark plug bosses, being able to get a socket on the spark plugs & still allowing for things to clear on moving & fixed parts behind the cover. I can see why these are very rare & not a lot were ever made. Also the side plate has to be flat so it does not leak oil. There will be some checking & there may be a little bit of grinding to get the clearance required for it all to fit. One very interesting thing is depending on the day the spark plug holes can be a mm or 2 out on the cylinder head & not all of the bolt holes that hold the side cover to the engine are in the exact spot. It might depend on who machined it or how happy they were on the day when the cylinder head & blocks were machined. Well hopefully it wont be long now & there will be many more well dressed early Holdens with alloy side plates. After looking & studying many of the old brands we can now see some of the reasons why they leaked & cracked. 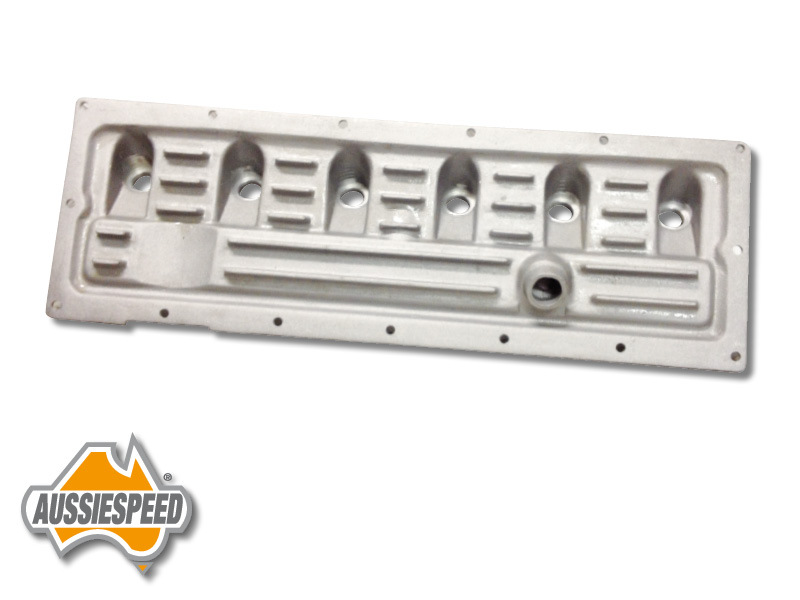 When we designed & test fitted it we not only wanted the Aussiespeed Holden grey motor side plate to look real good but also wanted it to seal & use of the shelf gaskets and seals. 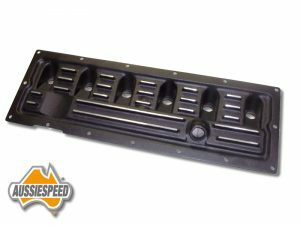 The plate has a molded back to stop the gasket from slipping inside the block & once glued to the sideplate it shouldnt move. The spark plug seals have a 4mm gap on the rear face of the cover to the plug seal face on the cylinder head. The std seals we used were made by AA Gaskets and are 7mm thick allowing for a 3mm crush when fitted. 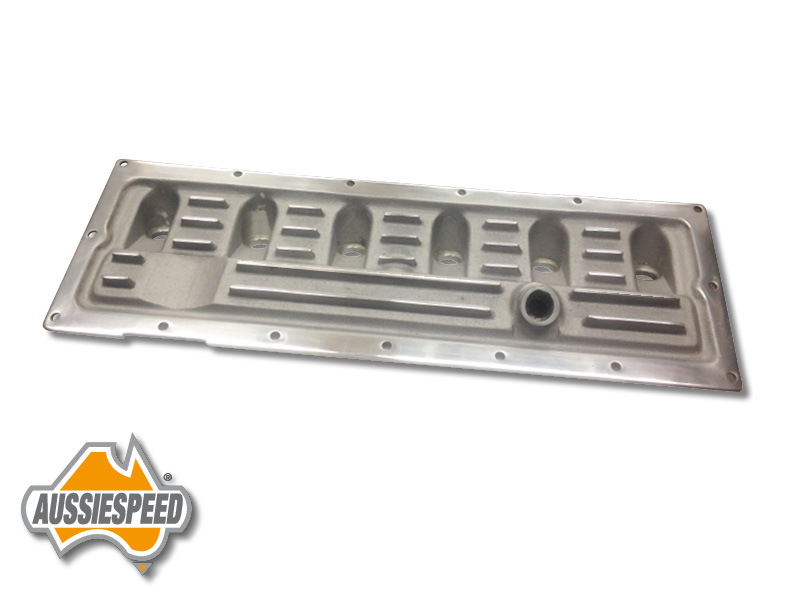 When fitting the Aussiespeed sideplate be sure both the head & sideplate are cleaned of grease or oil before applying any sealant. The mating flange of the cover where it is fastened to the head & block is around 4mm. with the casting being not to thick or not to thin it will allow for any incorrect alignment in the head & block to give better sealing. The fitting for the walking stick on the side of the engine uses the std stick to slip in to the boss. on the inside the breather is drilled & has a 4mm plate welded to stop oil running directly out of the breather hole. 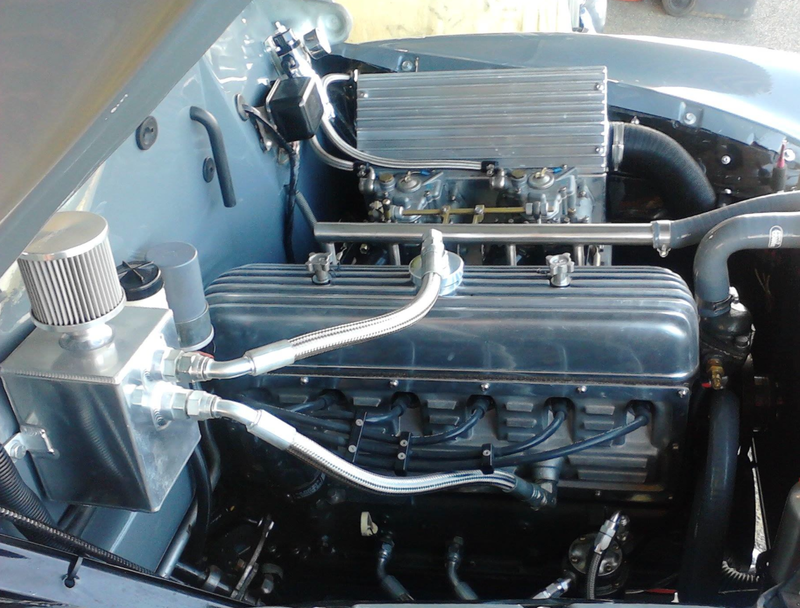 When test fitting we found a difference in spark plug & rocker location on some Holden grey motor heads. on the back side of the side cover where the pushrods run past the spark plug glands may need a small amount of metal removed if you have any clearance problems. We have also changed the fin shape of the production model to a square type fin & the fin stops short of the walking stick breather to allow for easier polishing. There were a few made with the round fin & in years to come may be a collectors item.